Enjoy convenient access to local attractions such as Thunder Valley Casino Resort and Historic Folsom as well as downtown Sacramento while staying at this Roseville, California hotel. Whether traveling for business or pleasure, the Best Western Roseville Inn offers all of the amenities and services to ensure an enjoyable stay. Conveniently located to Northern California's Highway 80, this Roseville area hotel proudly offers 132 spacious and well-appointed guest rooms, each equipped with cable satellite television with HBO and high-speed internet access. Start each morning off with a complimentary savory hot breakfast buffet before spending the day sightseeing. This Placer County hotel also offers an outdoor swimming pool, business services and a separate meeting room. Pets are welcome! 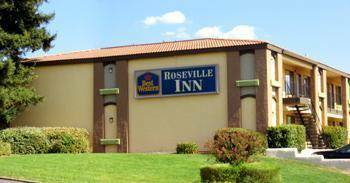 The Best Western Roseville Inn is conveniently located just 12 miles from the heart of downtown Sacramento. Spend an afternoon touring California's State Capitol building, the Sacramento Zoo and California State University. Less than five miles from the hotel guests can visit historic Folsom, the Thunder Valley Casino Resort or the Prairie City Raceway Park. Traveling on business? This Sacramento area hotel is minutes away from Agilent, the Union Pacific Railroad, McClellan Air Force Base and Intel . Families especially will enjoy an afternoon of shopping at the Westfield Galleria Mall or a day of fun in the sun at the Golfland Sunsplash amusement park. The friendly, helpful staff at the Best Western Roseville Inn is ready to ensure a fun-filled memorable stay in Roseville, California. Make a reservation today and save! From: Interstate 80. Take the Douglas Boulevard west Exit. Travel on Douglas Boulevard to Harding Boulevard. Best Western Roseville Inn is approximately one mile from this point.